GO LIVE ON SOCIAL MEDIA... INSTANTLY! We create amazing immersive videos, Gif's, Boomerangs and photographs with one aim. 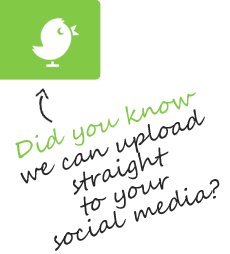 To quickly and effectively get you brand awareness and shares on Social Media! Your guests will be delighted with what we do and want to share it. Full Frame Events are always the first to have the latest technology. We have mutliple ways to achieve this. 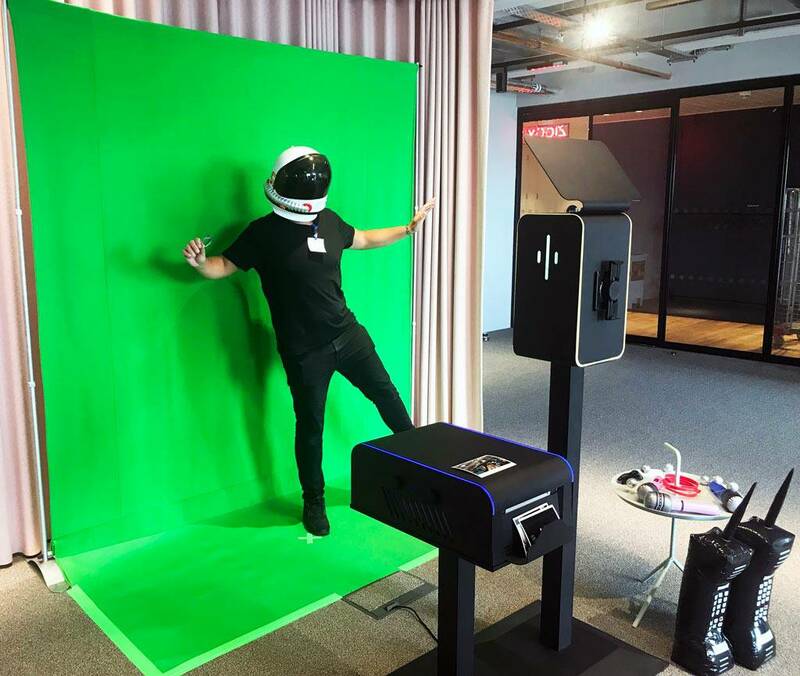 We have the latest Roaming Ring Booths, 3D 360 degree booths and Bullet time arrays. Any new technologies that appear are quickly tested and dded to our portfolio. 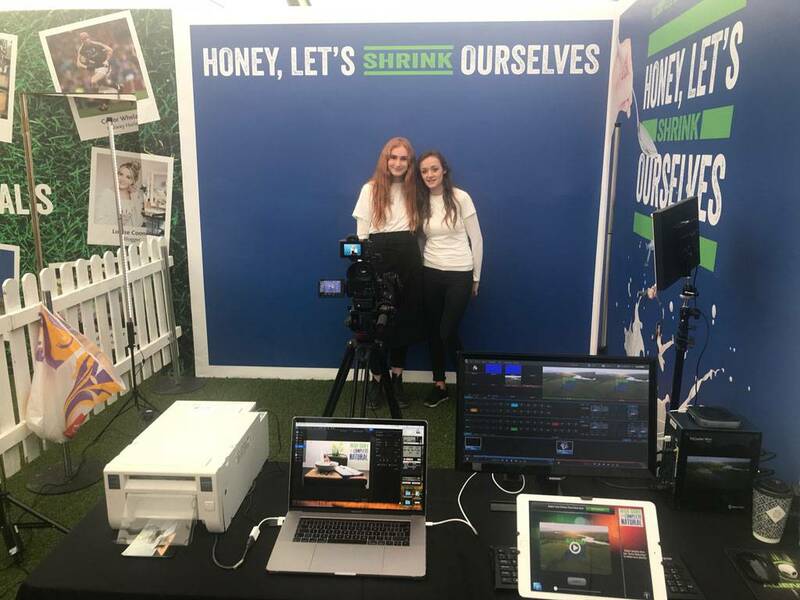 Green screen photography and Green screen video are our speciality and produce truly memorable and engaging interactive experiences that guests will share socially.. 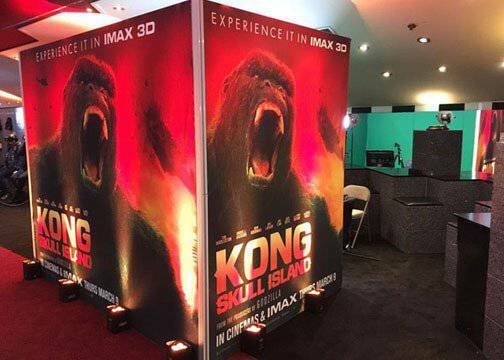 Guests are transported into unique 3D virtual scenes created especially for you. Stunning studio quality branded photographs, GIFs and Videos are instantly uploaded to mobile phones and email and also shared live on popular social media platforms including Facebook, Twitter and Instagram, gaining maximum exposure for your event. We print instantly and share live! 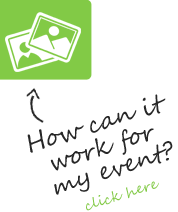 See our portfolio of events here. 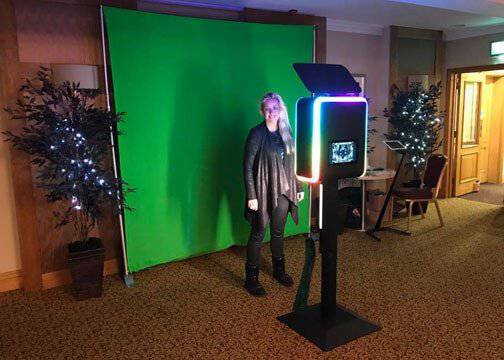 Our portable Green screen video system is a unique activity that draws the crowds at any event. Your guests can star in a movie, sing on stage in a musical, present a TV show, score a winning try, smash a six or celebrate a touchdown! Anything is possible. The video is created live by Full Frame Events with special effects, branding and titles, and shown live on big screens.  The movies are uploaded instantly to social media. We've travelled all over the world and appeared at the most prestigious events. Until now green screen video was out of the reach of most budgets, we've made it an affordable reality. Our systems are compact, portable and complete. Our staff are highly trained, very presentable and great with guests. 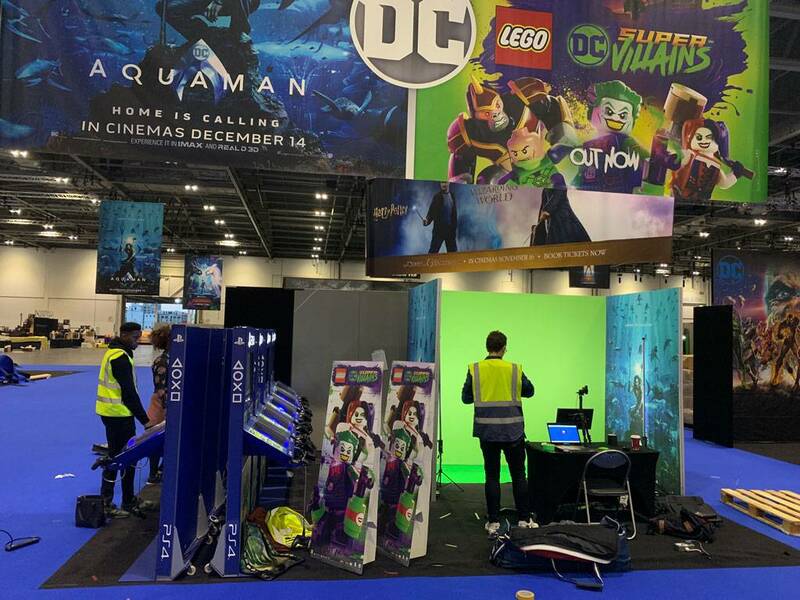 Aquaman Green Screen Video at Comic-Con London for Warner Bros. When Warner Bros need a company to cope with the chaos of Comic-Con, they send for us! 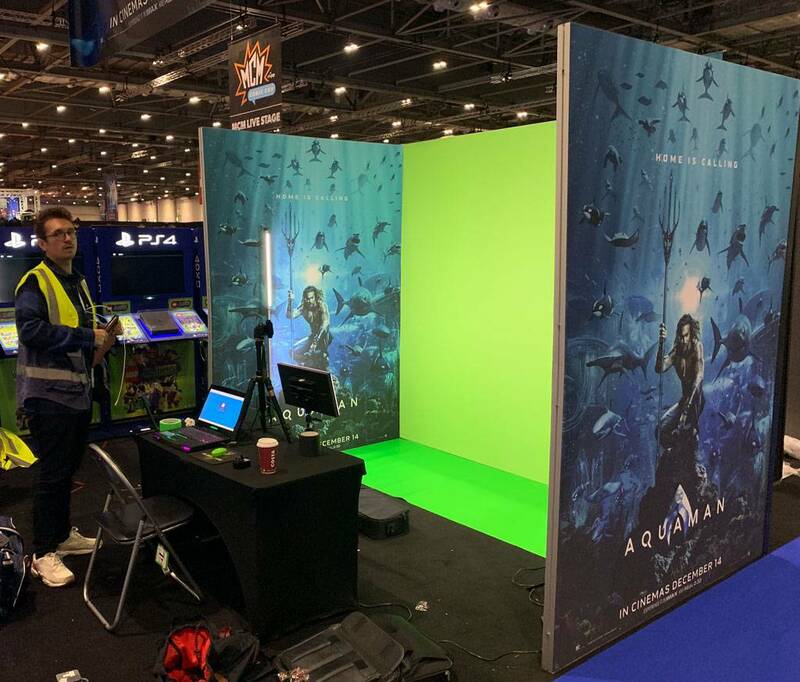 For this job we were putting visitors into a specially created clip of the new Aquaman Movie using live green screen technology and social sharing. This shot shows us building the custom designed three sided enclosure. There are full size graphics inside and out with a custom green screen and floor. When we arrive it's a blank space with a plug socket. Once we have finished we have a fully functioning green screen studio running off a very compact Alienware system with studio led lighting ensuring quality. 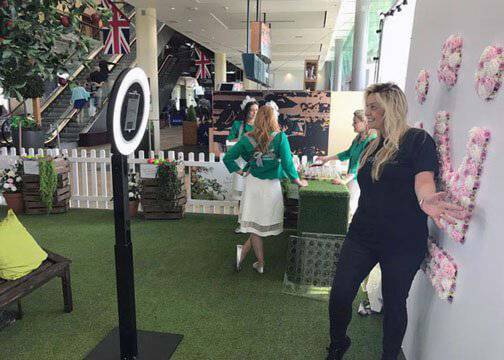 We also test the system prior to the event, staff the stand with our fully trained and very patient staff, and strike the set at the end. 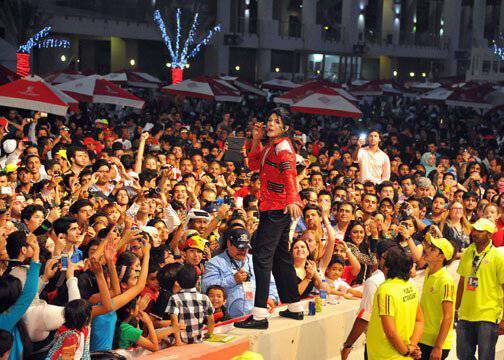 And this is just one of our activations at Comic-Con, we have others. Guests were given a real Aquaman Staff from the movie to hold, and we filmed them on a compact 4k camera. The processing was very fast and guests could then use our sharing station to send the video to themselves. We produced hundreds each day, here's an example. Here's a shot zoomed out showing how big the ceiling graphics are in comparison to our complete setup which only occupies a 3m space! Space at events like Comic-Con is expensive. We can work in small areas with our very portable and powerful systems. When we were asked if we could shrink people and pop them into a bowl of cereal live in real time we were intrigued! We were also asked if we could do green screen photography and green screen video with social sharing and printing all at the same time. This is the kind of challenge we enjoy! So we filmed a special chromakey video sequence for the Irish Dairy Council. We created everything ourselves, from the video sequence to the music to the branding. This was for the Irish Ploughing Championships which is the biggest outdoor in Europe with over 300,000 people attending over the three days! 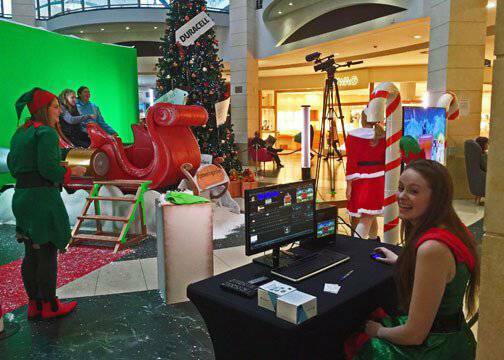 When we arrived we quickly realised that the branding and graphics on the huge stand wouldn't go with the green of a green screen. 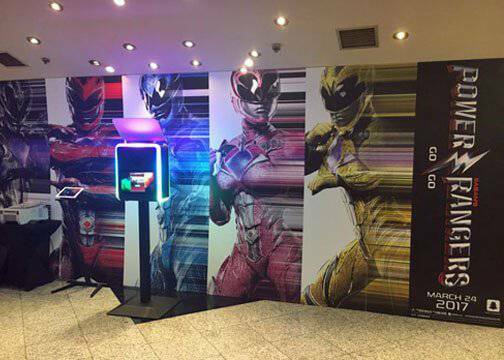 So we used the blue wall that you see in the photos and recalibrated the system to take out blue instead of green. The Client was delighted! Here's a shot of our setup. Although this looks like a lot of kit it's simple for us to setup, and although very powerful, is very portable. We flew with all of it in standard luggage! Including all the lighting! So from the left is the Photo Station Printer, latest Macbook running the Blue Screen software to print the photos, the iPad Pro we use for live sharing to social media, and our TV Studio for creating the live blue screen videos. Plus our own WiFi and a Coffee, essential for setting up. 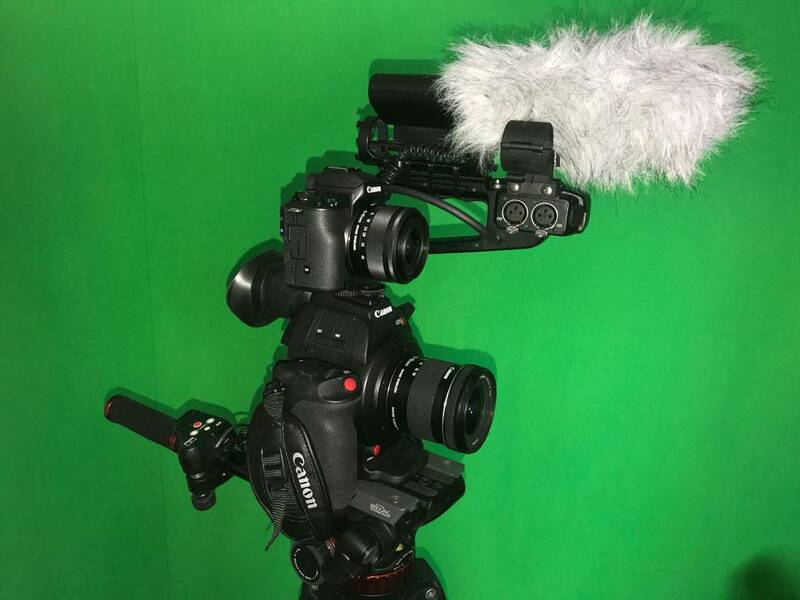 We came up with a unique solution for using our Pro Canon C100 Mk 2 Video camera and the new Canon Mirrorless DSLR at the same time, see below! We were extremely busy right from the start as this was a huge stand with all sorts of celebrities and tasting sessions going on. The system was extremely quick and we got hundreds of very happy guests through. We linked our TV Studio into a large screen TV so everyone could see the magic happening live. Below is a test shot of Elaine just before we started. We had to keep the files sizes small so guests could email and share easily so these are HD but optimised to view on a smart phone. We ran continuously as always by rotating our staff. The Clients were very happy with what we produced and quickly realised they could just leave us to get on with. Thats what we aim for, they had enough to organise and we had a great Green room with amazing locally sourced Dairy produce. We did manage to get a little bit of video of everything in full flow on our mobiles.